Warning:Innocent creatures were harmed in the making of this evening out! It all started so well. A lovely swim followed by a delicious lunch of chicken and mango salad and a mango smoothie, #itsmangoseason, and then a catch up with Vicky after her week away (and a chance to buy a huge bag of ripe mangos to boot!). It was during this catch up that I received an unexpected, and welcome, invitation to dinner with Phirum and some of the other VSO staff. We were to meet at a restaurant called Spark, part of a micro brewery and entertainment complex near to the Chinese Embassy. Leaving Vicky’s bike we headed out to hail a tuktuk and were immediately approached by a heavily bearded guy who looked more like Mr Myagi having let himself go than your average Joe tuktuk driver. We set off and were soon at our destination, a huge outdoor dining arena with a row of food huts and a bar. Having found our hosts we sat down and were offered the menu to order from. I, in hindsight foolishly, said I was happy to eat whatever they ordered (in fairness the menu had no English in it and it was difficult to determine from the pictures what each dish was) and Vicky agreed, although quickly added that this did not include ants (more on that later). We sat and chatted while we waited and then the first dish arrived. Chips and an individual dish of ketchup for each of us. We tucked in and soon the contents of the plate were no more. The next dish to arrived had been described to us as honey when it was ordered and indeed did look very honeycomb like when it arrived. I tentatively took a bite and I think confused best sums up my reaction. Expecting honey I had been prepared for extreme sweetness which just wasn’t there, but then again neither was savoury, or spicy or pretty much any flavour to be honest, just a vague mushy nothingness. In total innocence I then invited Vicky to try it, keen to get her opinion on the oddity. Vicky even more tentatively extracted one of the white bits, took one bite and exclaimed “maggots” whilst simultaneously pulling a face and bursting into laughter. The whole table erupted as I feigned righteous indignation and disgust at their audacity in tricking me. I then tried without success to grasp why on earth they chose to eat this oddity when it had neither taste nor texture but my attempts were thwarted by the continued peels of laughter and occasional hysterical shriek emanating from my colleagues. In an attempt to appease me another plate of chips was ordered and meanwhile we tucked into what is basically the dried on bit that forms at the bottom of the rice cooker with fried and green onion strips sprinkled on it. Apparently, this too is delicious. I personally beg to differ. It tastes a bit like chewy, slightly soft popcorn and annoyingly sticks like glue in your teeth! The bottom of the rice cooker #delicious!?!?!? If you can tear yourself away from the look of horrow on my face in the above honeycomb eating pictures you will undoubtedly see the beautiful blue sky. In true Phnom Penh, rainy season style as day turned to night that lovely sky had turned to a stormy one and we were now being rained on. The canopies were expertly lowered by the staff who no doubt do this nightly at the moment and we sat listening to the rain and sharing stories and laughing together (mostly at my expense) especially after my Facebook posting of my experience prompted another colleague, Pichchip, to join us at which point the story was recounted for his benefit. The evening wore on and the rain got heavier. The canopies were prodded with poles to releas the accumulating pools in them and slowly the ground beneath us turned into a pool of water. Lightening flashed, thunder rolled, staff rolled up their trousers and carried on regardless and then out of the waterfall cascading in front of our eyes a soggy vision in blue appeared – Kheang and her boyfriend Kirik had finally arrived. And so the story was repeated once more whilst the new arrivals stripped off their soggy raincoats, sat themselves down and ordered more food. And now it is time to return to those ants that Vicky so ferociously rejected earlier in the evening. A plate was presented which, in fairness, looked quite tasty. Everyone declared it to be beef before Vicky quickly chipped in “with ants!” whilst pointing to the dish. I couldn’t see them tbh but Vicky assured me that if I took a photo I’d be able to see them by zooming in later and so I did as I was told and snapped away. Phirum then dug around in the dish with her chopsticks trying without success to find some eggs for me to photograph. By this time my stomach was beginning to do a funny turn so I politely asked her to stop (cue laughter) and the dish was placed down and devoured, along with another plate of beef (although by now I was convinced it was actually reconstituted elephant dung or similar and so politely declined to partake). Not the most delightful meal I’ve eaten since being here for sure (very glad I’d had that amazing and huge chicken and mango salad for lunch!) but certainly one of the most fun, entertaining evenings spent with my lovely VSO colleagues and a great opportunity for a blog post too! On Monday I rocked up to work at 8am to an empty office in an empty corridor of a pretty empty Fisheries Administration building. Nothing strange there, or for the next couple of hours as I sat alone reading through emails and doing a bit of work for some upcoming meetings and training at VSO. And then it all turned a bit strange! I was summoned to see Hong Hyi (oh he of the single long hair protruding from his chin and bane of poor Sophea’s life). Over my time in the Ministry of Fish I’ve worked out that Hong Hyi is actually the main sticking block when it comes to getting the HR team to engage with the work I’m here to do. I haven’t worked out what his political agenda is, I just know that he has one and it doesn’t include doing what the EU ask of him. A couple of weeks ago at one of the fabulously dull meetings I sometimes attend he had argued vociferously against the head of the EU programme’s suggestion that, in the bid for funding for 2017 his department should change the focus of their work from delivering training direct to communities to supporting the development of staff capacity in the provinces for them to then be able to go out to communities and cascade the training. Sure enough, when the bid was submitted, there was the same old request for travel and subsistence (DSA) for staff from Fisheries Central Office to deliver training in each and every community fishery. At the time I afforded myself a little snigger and thought little more of it. Which brings me back to Monday and my summons. I trotted down to Hong Hyi’s office and, without looking up from what he was doing,he beckoned for me to sit next to him at the computer. Once there he opened up a spreadsheet and started muttering about change and training of trainers and communities and a lot of stuff that didn’t make a lot of sense. Thankfully the spreadsheet was in English and so as he rambled on I had a read and it all became crystal clear. He had called me down to ask me to help him to change his bid as it had been rejected by the EU for not focusing on capacity building (exactly what he’d been asked to focus it on in the meeting I referred to previously). And he was neither happy with having to change the bid nor the fact that he didn’t know how to and therefore needed my help. I tried to surpress my urge to adopt a smug grin and focused instead on how lovely it felt to be asked to inpit into the work of my department in the Administration and together we came up with suitable wording that helped him to understand what it was that he was now asking for money for. After this little triumph I went back to my office to continue my week absolutely basking in the glory of having been asked to help and by non other than Hong Hyi – surely this had to be the pinnacle of my week. But no. Since then I’ve managed to overcome a huge hurdle in our quest to pilot job descriptions in the Administration thanks to an introduction to a whirlwind of a woman with connections in the right places on Tuesday. And ftoday I finally met up with a slippery fish at the Ministry of Agriculture to get started on another piece of training and development work I’ve been asked to complete. I don’t know whether they’ve put something in the water or if the full moon last week has shifted something but whatever it is I’m not complaining. After being here for nearly 4 months already I finally feel like I might be making progress at work – something I’d almost given up on. All I can say is, long may it last! Being transported back to the 80s courtesy of a tuna and sweetcorn tea followed by Pick of The Pops on Radio 2 – ACIEED! Saturday has officially been a good day! p.s. Did I mention it’s mango season?! My role as Fisheries Administration Unofficial Agony Aunt has continued since I first wrote about it, however, a visit from one of my regular ‘clients’ shortly after the Pchum Benh holiday has led to an adjustment having to be made to my service offerings in this area. My client (let’s call him Fred) came in to my office and sat himself down in one of the two chairs in front of my desk. Our conversation started as usual with me asking Fred how he was and Fred responding with the latest tale of woe to hit his beleaguered existence – in this instance a case of dengue fever in one of his sons leading to an extended stay in hospital over the holiday. Fred soon exposed the true source of his concern – true to form it was actually the cost of his son being in hospital that was his true woe. I nodded and ahahaed sympathetically as he explained the costs of the hospital stay ($95 per day) and the additional expenditure for blood tests etc. Fred went on to complain about his salary, the pitiful daily subsistence allowance offered by the EU (apparently it’s so low now you actually have to spend all of it on accommodation and food on missions rather than being able to save most of it as was previously the case!) and then suddenly there was a huge crack and Fred was unceremoniously dumped on the floor from the chair whose base had split cleanly in half. I gasped (and covered a rogue laugh) as Fred quickly jumped up proclaiming that he was fine and stared in disbelief at the chair carnage in front of him. I quickly dismissed his suggestion that we glue it back together and shoved the chair unceremoniously into the office graveyard next to the unloved old PC and fax machine whilst at the same time asking Fred again if he was sure he was ok.
And at that moment I realised, that was it, my career as a couples’ counsellor was over before it had started. No longer would there be two chairs available should any of my colleagues in the Ministry of Fish decide to bring their other half along for a good moan. I saw Fred again just before I left for my whistle stop trip to the UK. He declined to sit in my remaining chair, instead standing by the door as he told me of his intense back pain after his fall and how it had been so bad he’d had to visit the doctor. He was laying it on with a trowel and for a while I was puzzled at how disappointed he seemed to be by the doctor’s assertion that he was absolutely fine. And then I heard what I thought was the word compensation and the penny dropped, my lovely client (and chief money moaner) Fred had seen an opportunity to make a buck and sadly been thwarted at the first hurdle. I’m currently (yet again) sick! And annoyingly, every time I get physically sick here I get a bit emotionally sick too. I turn into a pessimistic, life hating troll who can see no good in myself, instead basking in Norman’s cruel taunts and adding fuel to his fire in any way possible. This time as always, it kicks off with questions about the authenticity of my illness. I collude with Norman and together we come to the conclusion that I’m not properly ill, I’m just skiving and being lazy, because I am, at the heart of things, an incredibly lazy person. Which leads nicely on to my lack of ambition. I never stick at things, I just want an easy life, I’m perennially bored but avoid hard work or in fact doing anything at all – blah blah blah the tirade goes on. I compound the lazy assertion by lying listlessly watching shite tv (yep back to back episodes of Real Housewives – shock horror!). Ignoring the fact that the mindless viewing is interspersed with regular visits to the bathroom to perform stomach and bowel cleansing activities, I return periodically to my conversation with Norman on the topic of my fraudulently ill status. This isn’t real illness, anyone else would go to work but oh no, not me, lazy cow that I am, I just want to sit here sweating like a moose (do Moose actually sweat I wonder and if not why on earth do I use that phrase?) with a blinding headache and a big fat miserable chimp for company! And then I manage to flip it briefly and think about what I want to do with my life. The last few weeks have opened up some great opportunities for me professionally and made me think carefully about how to drive my life forward to make sure I’m getting what I need from my work. But again Norman invites me to join him in a self-flagellation session reminding me that I’m not a fully qualified counsellor or coach or anything basically – just a big fat fraud! After a day of this toing and froing I tell Norman to do one and turn to sleep to find respite from my own head, only for the whole thing to kick off the whole thing again 14 hours later when I eventually wake up to Norman quickly pointing out what a lazy cow I am for sleeping so long. A case of same sh*t (metaphorical and physical) different day on Tuesday, although the table was definitely turning as I found myself arguing with Norman more often than I was agreeing with him. And so to day 3. I’m back at my desk, still not 100% fit physically but getting there and 110% ready to tell Norman to do one and get on with living (and loving) my life. As you know, I wrote my last blog from the unprepossessing surroundings of the Heathrow Terminal 5 Travelodge (more correctly the Slough Industrial Estate Travelodge) due to an impromptu visit to UK on a ‘mission of mercy’ getting an unwell youth volunteer back home. In the space of 72 hours I travelled 6000 miles to go 6 hours back in time, spent 36 hours in that time zone and then flew another 6000 miles to be back in my GMT+7 world. 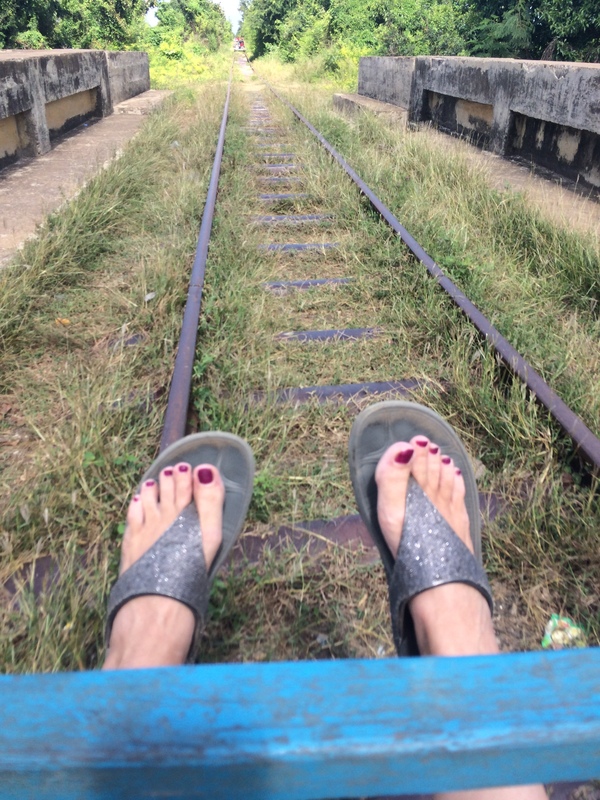 I experienced a temperature drop of approximately 24 degrees in the first 18 hours (I left Phnom Penh in 30 degree heat and landed in Heathrow to 4 degree arse freezing coldness) and went from being constantly too hot and sweaty to needing to wear all of my clothes to vaguely keep the chill out. My flip flopped feet were not at all impressed with my location change and I could almost feel my tanned skin peeling off as the cold sank through to my bones. Slough is as depressing as the Office makes it out to be but it’s conveniently located for my lovely friend from Brighton to come get me to have lunch. There are unofficial breakfast sittings operating at Travelodges around the UK. 6am sees the arrival of the tradesman; by 6.30am the white collar workers have started to appear and 7am heralds the start of the tourist trade in the breakfast room. As a time traveller I partook of all three sittings whilst also helping myself to copious amounts of teabags for my trip back to the future. I have the best mum and sister in the world! Travelling down to London to see me, delivering my new Fitflops, drinking tea and eating cake with me and generally giving me a day filled with joy and laughter. The UK in the sunshine is a pretty special place (and it looks amazing from the window of a plane first thing in the morning). British TV is shite! Especially as they don’t play repeats of Real Housewives between 2am and 6am for time travellers like me, desperate for a fix. I really do love my life in Cambodia. It was nice travelling back in time to the UK but it felt exactly like that. A trip to the past – not my present and not my future (or at least foreseeable future). I loved every bonkers, exhausting, crazy minute of the adventure. It was mad, I was knackered (still am), I physically ached from the hours spent on planes and hunching up against the cold, I spent a fortune, but most of all I got a story to tell and if there’s one thing I’m finally acknowledging about myself, it’s how much I love to be part of a story worth telling. Back in Cambodia I am once again hot and sweaty, I have 3 new bites already and a mild dose of the sh*ts, but do you know what, even if I could I wouldn’t change a thing! I’m writing this blog from a Travelodge in Slough (living the dream eh!) and I’ll tell you a bit more about it in my next blog, but for now I want to tell you about how my week of time travel began. At the weekend I took a trip to Kampong Cham to join the group of 80 new VSO youth volunteers as they began their in country orientation before heading out to their communities in various rural parts of Cambodia. On arrival I was immediately transported back to a memorable day at the end of August 1998 when I and approximately 100 other wide eyed, eager and well intentioned volunteers arrived, jet lagged and bewildered, in Beijing to take part in our own induction programme. The mix of overwhelmed westerners not knowing which way was up and self assured locals going about their day to day business was uncanny as was the dague smell of damp that greeted me as I let myself in to my windowless bedroom. In an annex of the guesthouse a large badly lit and freezing cold conference room played host to the wide eyed (for wide eyed read spaced out) volunteers as they sat listening to a Cambodian teacher as he boomed out Khmer words and phrases over the PA system for them to repeat. What on earth is he saying? What time can I go to sleep again? How come she is getting it and I’m not? Will there be any edible food for lunch? Oh flip, what was his name again? All questions that I guess were floating through the volunteers’ minds just as they had through mine in that hot and smelly Beijing meeting room all those years ago. Chatting to people throughout the two days sent me time travelling again. Tales of being wide awake all night, feeling unconnected to their body, getting annoyed by other people’s behaviour, feeling sick, headachy and not being able to eat the food were all shared with me along with the fears of what was to come next, the unknown quantity that was in their case to be 12 weeks in a host family based in a rural community abiding by a code of conduct which includes absolutely no alcohol, a 7.30pm curfew and a ban on leaving said community (thankfully not rules that were imposed on my China experience – some of my most ridiculous adventures came about due to late night wanderings and on more than one occasion, excess alcohol!). People were dropping like flies, heading back to their rooms to puke or sleep, mosquito bites were compared, restaurant meals were snubbed in favour of a more familiar bar of chocolate or packet of biscuits (my first 2 weeks in placement all those years ago were spent living entirely on biscuits – the only recognisable food in the shop next to my school) from the onsite shop and more than one or two tears were shed. And I listened and I empathised and I sympathised and I reassured, safe in the knowledge that all of these feelings would pass and really flipping happy that I was only experiencing those same feelings vicariously this time.